Thank you to the lovely women from MSU Kappa Alpha Theta for raising over $3000 for CASA - and making stuffed animals for the children we serve! We appreciate you!! The much needed support will enable us to serve more children and make sure the right things happen for them. And thank you for presenting us with the check and the stuffed animals during your finals week! An incredible thank you to the wonderful women of the MSU Kappa Alpha Theta Sorority! As I went to share about CASA, these lovely women surprised me with a check for $5000!! We appreciate your support and heart for CASA's mission! Your ongoing partnership with our program truly makes a significant difference. Thank you!! It is incredible what you can do to raise support! Thank you Maddy and MSU's Kappa Alpha Theta Sorority for raising $2655 to support CASA's mission and making tons of stuffed animals that will be given to children coming into care! What an incredible gift! You all are wonderful and we appreciate you! 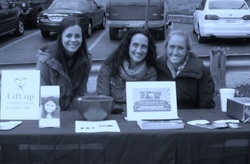 Thank you to MSU’s Kappa Alpha Theta for raising $1667 for CASA at a cookout in October of 2012.